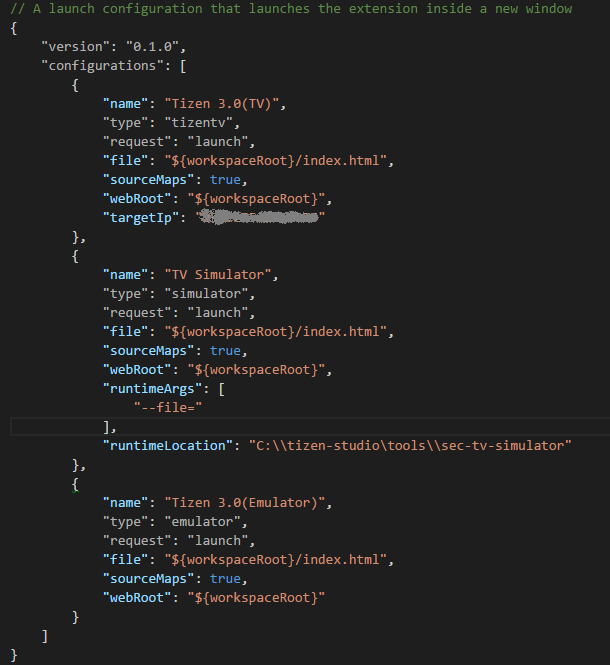 Visual Studio Code>Snippets>tizentvNew to Visual Studio Code? Get it now. 'tizentv' is a lightweight dispatch of Tizen Studio, which provides extensible IDE to develop/debug tizen apps in vs code. 'TizenTV' is a VS Code extension that provides a lightweight IDE for Tizen application developers, helps to generate, update and package an application, also run and debug an application on Tizen targets. The extension supports most of the basic features required to develop a Tizen TV app. It supports to create application using predefined templates, package the application, sign the application using certificate profile, launch a command prompt to execute sdb commands, run or debug application on TV Simulator, Emulator and Tizen TV.